Price: Professional mouth guards typically cost $180 and martial arts or MMA professional mouth guards typically cost $260. With such a low cost price tag, a custom mouthguard can help protect you from otherwise very expensive dental treatment. Just think, if you or your child is playing football or tennis or soccer, and gets hit in the face with a ball, chipping or completing knocking out your teeth, you could be in for a range of treatments. You may need implants and crowns and bridges, which all add up over the long-run. And, just think, all of this expensive dental work could be avoided with the purchase of a mouthguard. They protect one of your most vital assets: your teeth. Once you have lost all your baby teeth, you only get one set of teeth to last a lifetime. Mouthguards help to protect these. Mouthguards help to prevent a range of very expensive dental work. 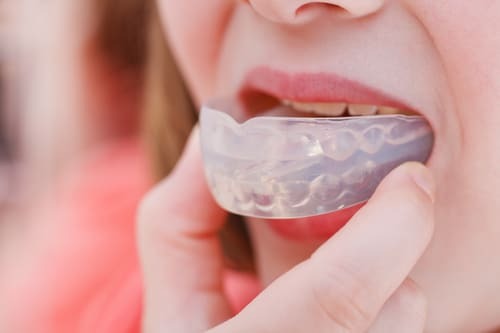 The initial cost of a dental mouthguard is very affordable, and adults will only require a new mouthguard every few years, depending on how often the device is worn. Children may require more frequent updates, given their rapid rate of growth. At your first visit, we will check all of your teeth for general health and wellbeing. If all your teeth and gums look healthy, then we will take a cast of your mouth using a special dental putty. This cast is then sent off to so that a tailor-made mouthguard can be manufactured to your exact measurements. This prevents all the issues that can arise if you buy a cheap, ill-fitting mouthguard from a sporting goods store. Once your mouthguard has been made, you’ll need to pop in to see us, and try it on to check that it fits properly. That’s it! You can go out and enjoy your football games without fearing for your dental safety.